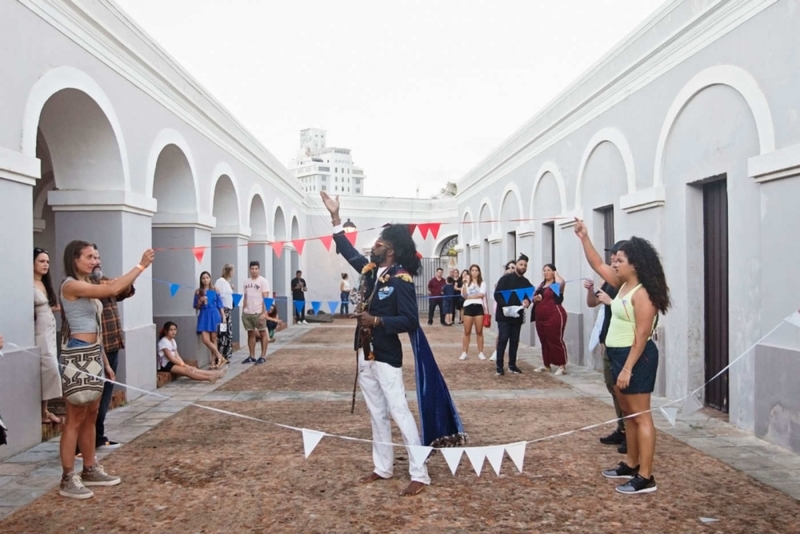 ...The fair opened on November 13 at the landmark Antiguo Arsenal de la Marina Española with over 30 exhibitors, including Bridget Donahue, 47 Canal, Gavin Brown’s Enterprise and White Columns, all from New York, SAMSØÑ from Boston and the Green Gallery from Milwaukee. Two weeks before Art Basel Miami and right after Artbo and FIAC, they each spent $3,500 per booth. And people showed up, including Museum of Contemporary Art Detroit chief curator Larry Ossei-Mensah, the Bronx Museum’s Deborah Cullen, and Storefront for Architecture’s new director José Esparza Chong Cuy. Writer and influencer Kimberly Drew, Untitled Art Fair artistic director and curator Omar Lopez-Chahoud, Ghetto Gastro co-founder Pierre Serrao, and MoMA museum educator Valentín Concha-Núñez gave talks. Rirkrit Tiravanija’s SMILES WITHOUT FREEDOM T-shirts, available in the VIP lounge, more or less summed up the vibe. (Báez once assisted Tiravanija).